The happiness of a mother of triplets have been cut short, after she was reportedly detained in a General hospital in Benue State, over her unpaid medical bills two weeks after the children were delivered. “Mr. 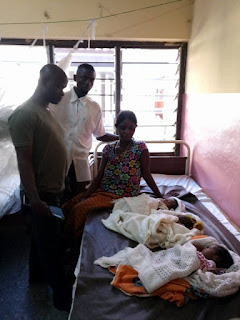 & mrs. Anongo receives a gift of triplets from god but cannot go home from the hospital due to inability to pay the bill of N77,600: a passionate appeal for emergency aid. The children which I gathered were delivered through cesarean session, which was done on the 10th of May, 2017 which means that they have been stayed at the hospital for more than 2 weeks now. Feeding is equally a challenge, hence they are of rural domicile and all the visitors from the village only come along with either pounded yam, akpu or other forms of carbohydrate foods. 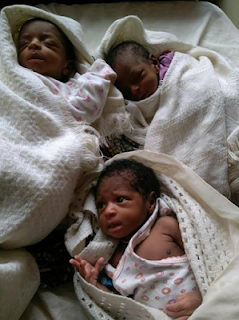 This has equally affected the new born babies who have not added in size since over the 2 weeks of their birth.